Today's review is composed of two sides. So bear with me through all of the negative comments: it does get better towards the end. The main fact is, if I weren't a chocolate reviewer, I wouldn't have bought this bar of chocolate (Tony Chocolonely's Extra Dark 70%). And I barely even bought it as is. That's how much I hate the packaging. Yes, we do judge books by covers and foods by packing: that's why package design and marketing is so important. This packaging I find ugly, with its bright colors and huge words (I should perhaps add that I find that it looks worse in person than in the pictures). The company is based out of Amsterdam (the chocolate itself is made in Belgium), so perhaps there is an aesthetic difference between countries that's giving me such trouble. (Or maybe I just hate bright colors that much.) Still, no matter how much I think about it, not only do I not like this packaging--it makes me want to turn away. I guess it kind of reminds me of the cheap Mexican candies for some reason, but a cheap candy look isn't exactly what I want for a bar of chocolate. And who's Tony? 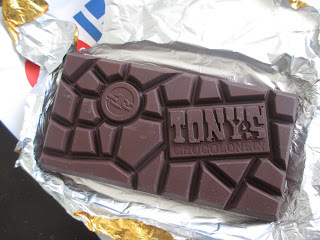 Certainly no offense to anyone who's named Tony, but it's more of a casual name and a name that doesn't remind me at all of chocolate, in order for these letters to take up the bulk of the space. Then Chocolonely? That sounds accusatory to me. Add to that the little lock symbol in the corner (in this day of digital symbols, a lock means private info that you don't have access to) and I feel unwelcome approaching this bar. Here we come to the main fact. You'll see that the little yellow circle there towards the top has the statement, "Together we make chocolate 100% slave free." You know that I've been placing a greater emphasis on fair trade (even so far as to decide to try and not buy/review chocolate that is not in some way fair trade), so you'd think I'd be cheering. But I've been looking at fair trade packing for years and this is the first time it's looked like this. I'm sounding very first world here, but this packaging doesn't make for a great start to a chocolate experience. You want to know that you're not having a negative impact on the world with the product you're choosing, but you also don't want to be thinking about that negative impact in the exact moment that you're eating the chocolate. If packaging makes someone feel uncomfortable, they'll either pass it by (without perhaps even thinking about it) or they'll just choose a different fair trade brand. This packaging looks like a pamphlet, not a chocolate bar. I am not trying to belittle this cause. I'm just saying that if the cause is the only important issue and the chocolate has no value, then by all means just give up chocolate. That'll end slave-produced chocolate. If, however, you are eating/buying chocolate, then you're obviously not giving it up--so the chocolate needs to have its own attention to quality, as well, not just attention to ethics. They make a big deal about not coating the paper they use to wrap the chocolate (even though the chocolate is still also wrapped in standard foil). But isn't it a popular style for craft chocolate to use uncoated, even recycled paper for aesthetic and hipster purposes? Use the paper and mention it, but don't make a big deal out of it. And all of this about how the chocolate bar is divided into unequally sized pieces in order to represent how things are shared in the chocolate industry. Same thing: don't make me feel guilty about putting chocolate in my mouth or I'll just stop eating chocolate. Is this a mission or a food? I know it's both (and again, it is a great mission), but the reality is that chocolate is not required for health purposes. I could live off of the three sisters (corn, beans, and squash, to those of you outside of the Southwest) that are grown locally, but I don't. So let the chocolate be chocolate, otherwise the positive experience gets lost and then what's the point in trying to pursue a chocolate experience after all? With that said, this is a cool-looking bar of chocolate. There are plenty of chocolates that have unevenly-sized pieces and I've also seen this broken style before, but I still like it. It's fun and it does make for a change from the usual squares. I do have to point out, though, that it could look better. There are so many big air bubbles in the logo. I'm used to seeing plenty of tiny air bubbles to show that something is handmade in small batches and such, but these air bubbles are so big that I wish they had given a little more attention into this part of the process. I must also add that this bar is massive. That's another thing that turned me off about it (I'm weird in that way). It's 170 grams. I'm used to the 80 to 100 gram bars being the big ones, and the 45 gram bars being the comfortably small ones. This is just huge, about double the average size. That makes no sense to me. If you're pushing the ethics of food so much, then you should be (if anything) trying to get people to eat less chocolate, not encouraging them to eat more by putting so much into one bar. Isn't part of the problem with the chocolate industry the fact that we consume so much of it, which is why so much of it is cheap and grown with slave labor? So limiting the amount of chocolate that we consume can help, too. This massive bar of chocolate just seems contrary to their mission that they're so blatant about. One last negative comment. Since when is 70% extra dark? That's average dark to me, unless you're talking about a candy bar (which will never get as high as a 70% cocoa content). So does that mean that this is a candy bar quality chocolate? I would certainly hope not, because then it would really not be worth my time and I really would prefer to go without. Fortunately, however, that is not the case. The aroma of this chocolate is a pretty standard dark chocolate smell; it reminds me of something I'd find at Trader Joe's. The flavor, though, is decidedly Ghirardelli. First I thought of their chocolate chips, but I think what I'm reminded of is their Twilight Delight bar. It has that sort of thick, silvery, chocolate-centered flavor with sweetness lingering around in swirls. The flavor stays pretty constant throughout, except that it gets warmer and softer as you reach the end. A little bit rich. Everything is just right about the texture, which is nice and smooth. Because the bar is so thick, each piece stays melting in your mouth a bit longer than usual, which I suppose can be nice. So while I may have had such horrible things to say about the packing, I do like the chocolate. Ghirardelli may not be the most couture chocolate (and if you ever see their truffles, steer clear: they're terrible), but I am fond of their chocolate (though I guess I don't really buy it anymore). For me to so directly compare this chocolate to Ghirardelli is a compliment. And given that Ghirardelli is one of those dark chocolates that appeals to the masses, I expect that this chocolate bar will, as well. I said there were two sides to this review, but I suppose it's really three: great mission, ugly packaging, and good chocolate. Interesting, I absolutely adore the packaging of Tony's and sought it out regularly when I lived in Germany or every time I visited the Netherlands. I also enjoy the way they intertwined their mission with the reason they did an unevenly broken up bar. Thanks for your comment! I'm glad to hear that other people do like this packaging. I'm curious to know if, as someone who visited the Netherlands, you noticed whether or not other chocolates were packaged with a similar style. oh definitely. and many colors. they also have more variety and some smaller formats as well. Interesting. I really don't come across much chocolate from that area of the world. Come to think of it, I'm glad that World Market is currently carrying Tony's: they seem to be carrying less and less actually international chocolate these days.